This week, I want to to talk about Echinacea. 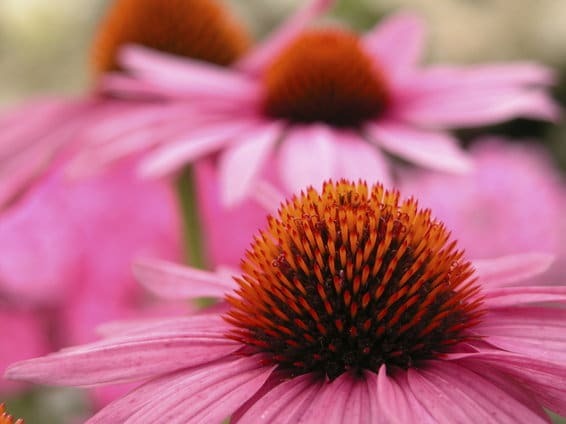 You’re probably familiar with Echinacea as a wonderful herb to take when you get sick. Not only does this beautiful flower (nicknamed “purple coneflower”) have lots of medicinal uses, but did you know it’s also especially beneficial for your skin? Echinacea has been used for hundreds of years by the Plains Indians. They observed sick and injured elk eating the plant, so it came to be known as “elk root.” Different tribes used the herb for different purposes, but many (such as the Kiowa and Cheyenne) used it for sore throats and other symptoms. How can Echinacea help your skin? Echinacea has incredible benefits for your skin. Scientific research from just last year reported that Echinacea was “effective in improving skin hydration and reducing the appearance of wrinkles.” Another study showed that it protected from environmental stressors. Echinacea can keep your skin youthful and beautiful. You probably already know Echinacea, when taken internally, also boosts the immune system and can help fight off the sniffles. Study after study has shown that a moderate daily dose of Echinacea at the first sign of a cold can reduce both its duration and intensity. Be sure to continue for a day or two after your symptoms subside, to help keep your immune system running strong. Because of all the amazing benefits Echinacea has, we knew it would be a wonderful addition to our blends. Try adding some Echinacea to your beauty routine!